These two panels give you a detailed list of the assets included or not in your build. You can click on any asset. 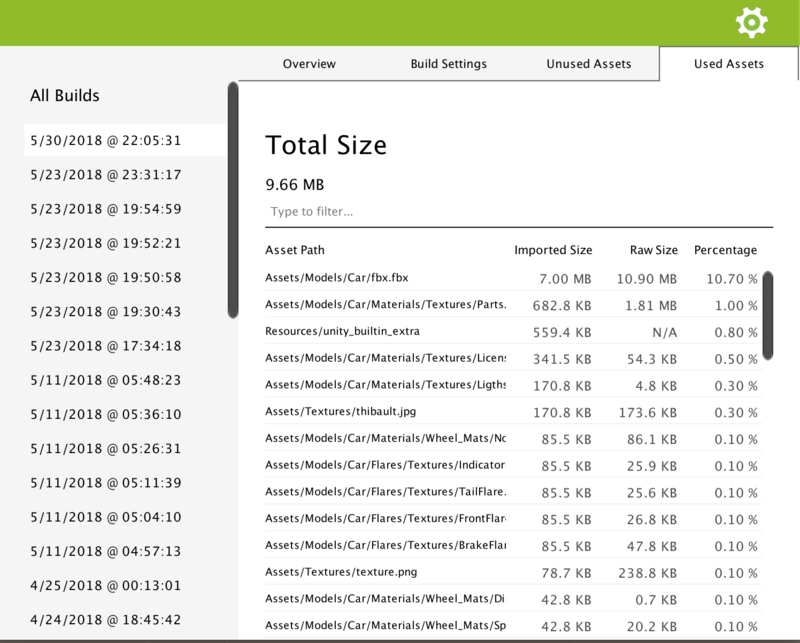 If the asset is located in your project Assets folder, the asset will be selected in your project panel. The Total Size on top of the list is the sum of all the assets Imported Size. This is the size of the asset after it was imported in the player. For example, if the asset is a .psd file and is imported under the format ETC 4 bits in the player, then Imported Size will display the size of the later. This is the original size of the asset imported in Unity. This is the size that directly impacts your VCS repository size. This is the percentage that represents the Imported Size over the total size of the build you can read on the Overview panel. Note that you can re-order the assets by clicking on the columns header. You can filter which assets should be listed by entering a value in the search field. .Peek will list all the assets which path contains all of the word you input. For example, if you enter .png car, all the asset with a path containing .png and car will be displayed. The search field is case unsensitive. These extensions are based on what is supported in Unity. Don’t hesitate to create a pull request or open an issue on Github if you find out relevant to add an extension here.